Between 2010 and 2015, Tanzania received more than $320 million in assistance via the U.S. government’s Feed the Future Initiative – the most of any country. But despite these commitments and an average of six to seven percent annual economic growth since 2000, Tanzania did not meet the first Millennium Development Goal: to reduce hunger and extreme poverty by half by the end of 2015. The Center for Strategic and International Studies’ Global Food Security Project, based on the magnitude of assistance, chose to evaluate U.S. agricultural and nutrition programs in the country “to see what this kind of investment has really meant for Tanzanians,” said Kimberly Flowers, the director of the project. A team traveled to Tanzania to interview senior government officials, NGOs, development practitioners, private sector actors, and aid recipients, producing a report launched in Washington, DC, last month. One of Africa’s fastest growing economies, Tanzania is expected to become a middle-income country in the near future. However, food security has long been a problem. The Global Hunger Index rated its food security concerns as “serious” in 2015 with more than 30 percent of the population undernourished. In a primarily agrarian economy dominated by small holders, investing in agriculture has significant meaning, said Nkya. Though certainly not attributable entirely to Feed the Future, since the start of the program started under President Obama, Tanzania has seen a decline in poverty from 34 percent in 2007 to 28 percent in 2012, and in extreme poverty, from 12 to 10 percent over the same period, according to the report. Jacqueline Mkindi, chief executive of the Tanzania Horticultural Association, said some farmers have improved maize and rice productivity by 200 to 300 percent, which not only enables them to feed themselves and their families, but sell more surplus. 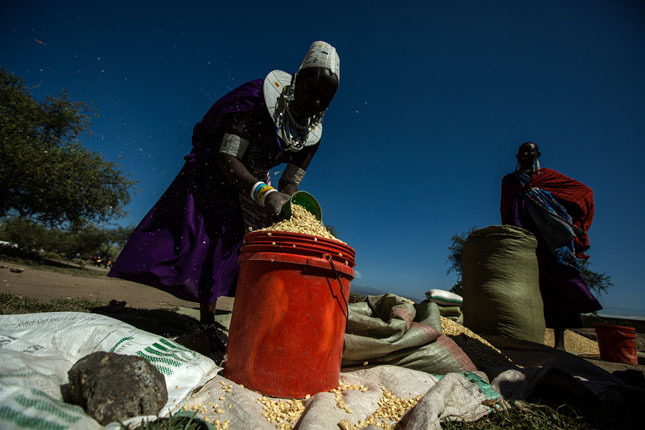 “Last year, the program helped Tanzanian farmers earn an additional $32 million in sales,” said Sharon Cromer, Tanzanian mission director for the U.S. Agency for International Development (USAID). This can be credited to building connections between farmers and markets and providing farmers with training through which they learn how to process what they have produced and increase profits, said Mkindi. The Mwanzo Bora Nutrition Program, which receives funding from Feed the Future and the U.S. government’s Global Health Initiative, has provided 1.4 million women with maternal and child nutritional services and trained more than 14,000 community leaders and extension workers on dietary diversity, home-gardening, exclusive breastfeeding, and targeted micronutrient supplementation, according to the CSIS report. Cromer also highlighted NAFAKA, one of Feed the Future’s largest activities, a five-year initiative focused on improving rice and maize value chains. In addition to providing training in financial literacy and good agricultural practices, NAFAKA members also received support in building community savings accounts and making joint investments in income generating activities. The savings and lending group is comprised of more than 14,000 Tanzanians, 71 percent of whom are women, said Cromer. The program can be “life-changing” for women, she said, by giving them access to credit. So far, NAFAKA has helped members save more than $700,000 and issued loans valued at more than $1.4 million, she said. Youth, as the future of the country and the largest generation, have also received special attention. Traditionally, agriculture has been regarded as the last career choice by young people, said Mkindi. But as techniques and technologies develop, they are becoming more engaged, she said, especially in non-traditional agriculture, such as horticulture. Feed the Future is striving to create a more enabling environment for young people by providing skills training, helping them see existing gaps, accommodating those without credit with innovative financing, and creating qualified logistics and stable policies, said Mkindi. NAFAKA, for example, supports young people working or seeking employment in the agricultural sector by training them on pesticide application and mechanized rice processing. “If you don’t prepare, the young population, which is born today, probably will not get the good-quality manpower,” said Nkya. Though the report makes clear the impact of agricultural assistance, it also reveals a series of problems which contributed to missing the deadline for MDG number one. “We desperately need to do more,” said Sharon Pauling, the Tanzanian mission deputy director for economic growth at USAID. One of the biggest problems is commercialization and access to markets for small-holder farmers. Efforts so far have not matched the dramatic increase in production, said Mkindi. It’s still difficult for many farmers to understand what’s happening in the market and sell their products effectively. Poor infrastructure is another thorny problem. “Infrastructure is required to make agriculture work,” said Jennifer Baarn, deputy chief executive officer of the Southern Agricultural Growth Corridor of Tanzania, a special economic zone identified by the government of Tanzania where 80 percent of Feed the Future investments are implemented. Infrastructure is crucial to both production (e.g., irrigation) and market connectivity (e.g., transportation). Baarn emphasized the necessity of alignment among infrastructure, agricultural growth, and development goals, indicating that sustainable development depends on all three keeping up with one another. Climate change is emerging as a new challenge in Tanzania. The “variable while predictable” problems, such as extreme weather, are having impacts that could discourage farmers and agricultural services, said Pauling. Nkya called for practical measures to mitigate and adapt to climate change, and suggested a heavy investment in “sustainable and responsible” irrigation to cope with rainfall changes. The report also identifies poor communication and collaboration among donors, implementing partners, the private sector, and government (U.S. and local) as an element that held back food investments. It ends with a plea to improve the “enabling environment” for food policy in Tanzania and elevate U.S. attention to land rights. Correction, May 12, 2016: An earlier version of this article mislabeled Feed the Future investments as “food assistance” in several instances. These are in fact agricultural and nutrition investments. CSIS also chose to evaluate Tanzania of its own volition. Sources: All Africa, Center for Strategic and International Studies, Japan International Cooperation Agency, International Food Policy Research Institute, Tanzania Daily News, U.S. Agency for International Development. Photo Credit: A Maasai market in Tanzania, courtesy of Morgana Wingard/USAID. What has not been said, and needs to, is that fertility remains very high in Tanzania. According to the US Census Bureau’s International Program Center, the 2015 total fertility rate was 4.9 children per woman — down from 6.1 in 1990, and seemingly descending slowly. In 1990, Tanzania’s population estimated at about 24 million. By 2015, its population had more than doubled — to 51 million. Despite extraordinary gains by “some farmers,” this is not a situation conducive to alleviating hunger through surplus agricultural production. For most of equatorial Africa, the battle for self-sufficiency has been lost — their populations will likely double again, from population momentum, before they growth comes to a halt. Thus, trade and aid will be a substantial part of these states’ strategies for feeding their people, for the foreseeable future. That doesn’t mean that high rates of malnutrition must continue. It means that states will have to re-focus on creating an urban economy that brings in foreign exchange with which to buy food. That requires long-term political stability and high educational attainment — neither of which are likely to be acquired without a reduction to a small family size and an older age structure (according to recent statistical studies; see work by Henrik Urdal, PRIO; and Lee & Mason, National Transfer Accounts web site (www.ntaccounts.org). That said, for a youthful country, Tanzania has been a remarkably stable ‘partial democracy’, much unlike its neighbors. It’s clearly doing “something right” politically. However, it has done poorly in terms of women’s rights and fertility. East African fertility has long been buoyed by polygamy (among some groups) and traditional marriage rules, which limit women’s rights to land, often deny them inheritance and restricting their rights to their own children in case of marital separation. Tanzania’s TFR could, indeed, decline dramatically in the future–TFR has already declined to near-two children per woman in in urban Ethiopia (but not rural). Despite the possibility, population momentum will continue to push population higher, maybe until the end of the 21st century. Aid donors need to get more realistic about equatorial Africa — and they should worry more about the region’s stalled fertility transition. Following the Apollo moon landing, former Tanzanian leader Julius Nyerere remarked, “While America has gone to the moon, we are still trying to reach the village.” At least Nyerere was trying. I would say a reasonable modification of this saying today would be “While those in the village wait for the rain; those in the state house walk to the fridge”. I don’t disagree with Richard Cincotta; but I do believe that the fundamental barrier to food security for all remains the disintegrated nature of most African states, so those in the village must fend for themselves because governments are doing likewise. Tanzania’s leaders are more eager to facilitate Asian food security through land deals than they are to ensure the health and well-being of citizens. After all, it’s much easier to say here’s the land and lots of money, help yourself but remember my 10% of the profit, than it is to work with hundreds of thousands of small holders to gain access to the necessary inputs to help lift them over the <1 t/ha/annum yield on their commonly held fields.